Epileptic seizures are the result of synchronous discharges of neuron groups in the brain that can lead to sudden and involuntary stereotypical behavioural or sensory disorders. There are numerous types of seizures, each of which requires specialised therapy. Therapy with anticonvulsive medication (antiepileptics) leads to a reduction in seizures and sometimes even a complete elimination of seizures in most treated patients. The condition is usually patient compliance, e.g. regular use of the medication. Therefore, monitoring of blood levels is essential, especially when starting the use of the medication, as well as for further modification for different life phases. For example, children usually metabolise medication faster than teenagers or adults. 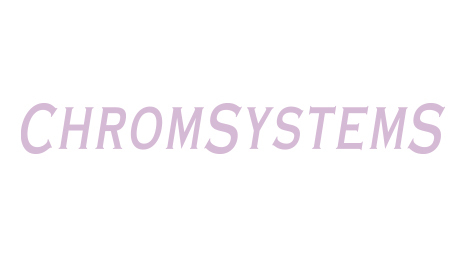 This Chromsystems AED kit enables the determination of the antiepileptics carbamazepine, ethosuximide, lamotrigin, phenobarbital, phenytoin, primidone, sulthiame, oxcarbazepine (Trileptal®) and zonisamide as well as of the metabolites 10-OH-carbamazepine and carbamazepine-10,11-epoxide in serum/plasma using HPLC. Sample preparation is based on a simple and very efficient precipitation of plasma proteins. 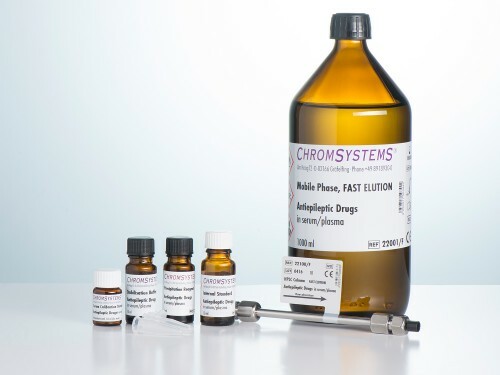 Fast chromatography (Fast Elution < 5 minutes) and high resolution chromatography (High Resolution) are available as options for quantifying the analytes. These analytes as well as other AEDs can also be measured with LC-MS/MS using our Parameter Set for Antiepileptics from the MassTox® Series A. A precolumn has to be used. Pipette 100 µl serum/plasma/calibrator/control and 150 µl Internal Standard into a reaction vial. Add 50 µl Precipitation Reagent. Centrifuge 10-15 min at 9000 x g.
Mix 100 µl supernatant with 100 µl Stabilisation Buffer. Inject 20 µl into the HPLC system. Stored at +2 to +8 °C for up to 1 week. For longer storage (up to 2 weeks) deep-freeze below -18 °C.